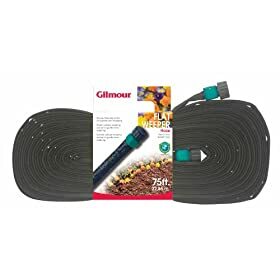 Gilmour Weeper/Soaker Hose 75-Foot 27075G. Unique construction of this weeper/soaker hose allows for efficient watering with less waste and reduced evaporation. It performs best with low water pressure, ensuring gentle, even watering for new plantings and keeping your plants beautiful.